Japanese women are not only known for their beautiful skin, but also for their well-kempt, silky, soft, and frizz-free hair. Even though Japanese women are very stylish and can be seen sporting different hairstyles which require harsh chemical treatments, they still manage to keep their hair looking healthy and strong. If you want your tresses to be beautiful like theirs, you ought to try these best Japanese hair products which are very popular in Japan! Believe it or not, switching your hair dryer to Panasonic Hair Dryer Nanocare will greatly improve your hair condition. Many Japanese women love this hair dryer and it has been the best-selling hair dryer for years. In October 2017, it is ranked the no.1 beauty gadget for hair on @Cosme. Panasonic Hair Dryer Nanocare will dry your hair really quickly which is a time-saver for those with long hair. In addition, it has a slight acidity which is similar to the pH level of scalp and hair, so it is very gentle and compatible with our hair and scalp. The greatest benefit of using this hair dryer is its nanoe technology which makes your hair look beautiful. Its ultra-fine nano ions has a moisture holding capacity of more than 1000 times compared to negative ions so your hair and scalp will be moisturized when you use this hair dryer. This is in contrast with regular hair dryers which will make your hair dry and frizzy. As a result of using this hair dryer, your hair will look so smooth, healthy and silky. You need to try it to believe it and understand the hype! Panasonic Hair Dryer Nanocare is more expensive than a regular hair dryer but it is a great investment for your hair in the long run because your hair will not be damaged by hair dryers anymore! Why spend so much money on hair treatment products to fix hair damage when you can have perfect hair so effortlessly with just a hair dryer? Milbon is a popular haircare brand in Japan. One of the star products by Milbon is the Deesse’s Elujuda Emulsion+. It has won major awards such as @Cosme Best Cosmetics Award 2016 Best Hair Care No. 2 and @Cosme Best Cosmetics Award 2015 Best Hair Care No. 1. As of October 2017, it is ranked no.1 on @Cosme’s hair care category. Milbon Deesse’s Elujuda Emulsion+ contains Baobab Extract, CMADK, and Aqua Collagen to moisturize and repair hair damage. Many people love this emulsion as it is lightweight and not oily, yet it effectively treats the hair, and smooths away frizz without weighing your hair down so your hair will not look flat. It also has a nice scent which smells so feminine and pretty. It is also a favorite product by hair stylists. Another very popular product by Milbon is the Deesse’s Elujuda Fluent Oil which is available in MO and FO versions. The MO Fluent Oil is recommended for coarse, unmanageable hair while the FO Fluent Oil is recommended for fine to normal hair. Deesse’s Elujuda Fluent Oil contains baobab oil which is an effective ingredient to restore hair cuticles. The FO version also contains Silk PPT while the MO version contains Olive Squalane to condition your hair and make them manageable. Of the 2 versions, the MO Fluent Oil is more popular. It won the @Cosme Best Cosmetics Award Best Hair Care No. 3 in 2015 and 2016. As of October 2017, the MO Fluent Oil is ranked no.3 on @Cosme hair care category. Deesse’s Elujuda Fluent Oil is a very popular Japanese hair oil treatment product because it is lightweight and makes your tresses really soft and smooth. It is highly recommended to use hair oil if your hair is dry especially after being subjected to chemical treatments. This product is a top choice in hair salons. Like many other Milbon’s products, the Fluent Oil also smells delightful. 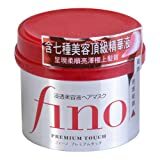 Shiseido Fino Premium Touch Hair Mask has been in the market for a long time yet it still continues to be one of the best-selling hair treatment products in Japan. This product was released in 2005 and it has won many major awards. Shiseido Fino Premium Touch Hair Mask won the @Cosme Best Cosmetics Awards No. 2 in the Hair Care Category in 2005 and 2006. In 2007 and 2008, it won the @Cosme Best Cosmetics Awards No. 1 in the Hair Care Category. In 2009, this product was entered into the @Cosme Best Cosmetics Grand Prize Hall of Fame. The popularity of this hair mask is unwaning as it is ranked no.2 on @Cosme’s hair care category and no.1 on @Cosme’s hair mask treatment category in October 2017. Shiseido Fino Premium Touch Hair Mask contains 7 beauty essence ingredients which are royal jelly EX, trehalose, PCA, phytosteryl derivatives, Lipidure EX, squalane, and glutamic acid. It works very well to make your hair smooth, shiny, and frizz-free. Some people use this mask in place of their conditioner because the mask is very effective to condition damaged hair. If you want to change your hair color, I would highly recommend you to use Kao Liese Prettia Bubble Hair Color which is very popular in Japan and in many Asian countries. As Japanese women have black hair which is the most difficult hair to color without bleaching and Liese products works well for them, this hair dye would be able to dye any hair color that you have. Kao Liese Prettia Bubble Hair Color is very popular because it is so easy to use. This product would foam up like shampoo so using this hair dye is just as easy as shampooing your hair. Therefore, you can easily dye your hair on your own without messiness. On top of that, your hair will be soft and smooth after using this hair dye. Many other hair dye products would dry out your hair but many users have experienced that Liese is quite gentle and they have not noticed any obvious hair damage! It has a nice selection of colors so don’t be afraid to experiment with different hair colors! Best Japanese Sunscreen Without Alcohol – Non-Drying! Hello. I'm sorry, I don't know if their products are vegan. Sign up to get the latest posts delivered to your inbox! Beauty Rabbit Hole © 2019. All Rights Reserved.